If you've been reading my blog, I'v mentioned a number of times or maybe a couple of times that I want quit my job and just be a SAHM (stay-at-home mom) or a WAHM (work-at-home mom). I somehow got a peek of what it's like to me a SAHM while I'm on my maternity leave and I loved every minute of it! I started thinking what can I do if I become a SAHM, I still want to earn money and be doing something aside from taking care of the BOS and the kids and managing a household. Then I saw this workshop on Dainty Mom's and I immediately signed up! Martine (of Dainty Mom) is who I look up to when it comes to a WAHM! She's rocking it! Her website is a great source for those who wants to be a WAHM. 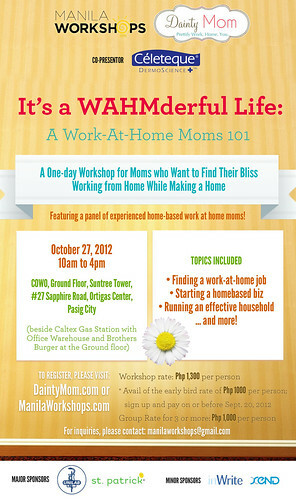 And now Manila Workshops together with Dainty Mom, is having a one-day workshop for us moms who want to find their bliss working at home! Fantastic, right??? The workshop is sponsored by Unilab, St. Patrick's clothing (of Numa Eco Baby Store), Celeteque, InWrite, and Xend.